A quick glance at the title may throw you, but this post is not completely random. Nope! In fact, it’s about bikes and food, with a few green notes for extra credit — completely on topic. While I rode in the Tour de Fat bicycle parade sans costume (i.e., wearing regular clothing), many riders outfitted themselves in creative ways. One of my favorites was a woman wearing a blue tutu. I coveted that tutu and decided that somehow, a tutu would factor into my World Naked Bike Ride get-up. Yep, that’s right, after talking about it for three years, we’re actually going to ride in the StL edition of the World Naked Bike Ride this year! In 2010, it just didn’t happen for some reason. In 2011, the event was either right before or after Gabriel was born, so I was either feeling very pregnant (and hot and lazy) or recovering from his delivery. Last year (2012), I just didn’t have the energy to makes plans for the event itself, child care, etc. So 2013 will be the year. 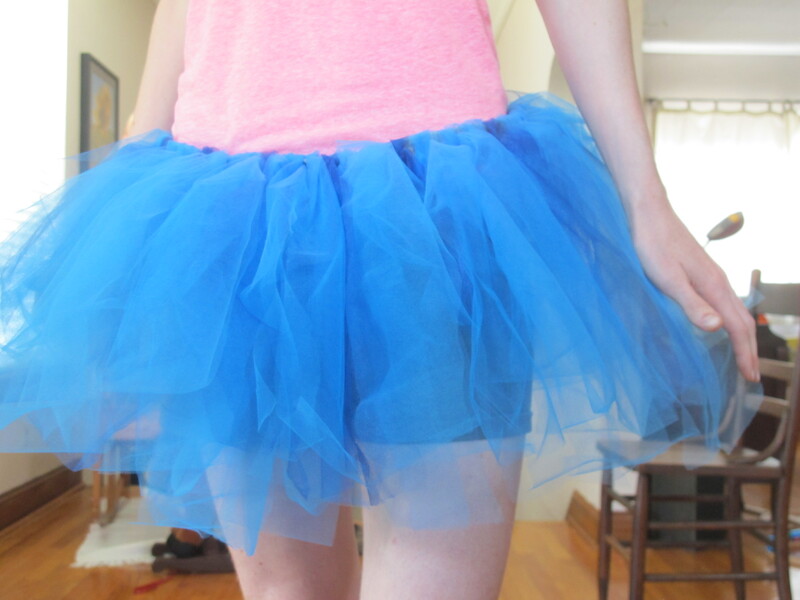 And it will involve this fabulous bright blue tutu that I made yesterday (when I should have been prepping for a job interview that I have later this week — oh well, perhaps I can add “Tutu Maker” to my resumé). Turns out making a tutu is rather simple. I made it even easier by re-purposing the elastic waistband from a pair of Matthew’s old, worn-out boxers. Now for the rest of my costume . . . .
On to the chocolate and peanut butter! I’ve wanted to do some baking for over a week now, but the hot weather does not inspire one to crank up the oven. No-bake recipe to the rescue! A couple of weeks ago, I flagged this recipe for Reeses peanut butter no-bake bars, and yesterday, I no-baked them in my kitchen. 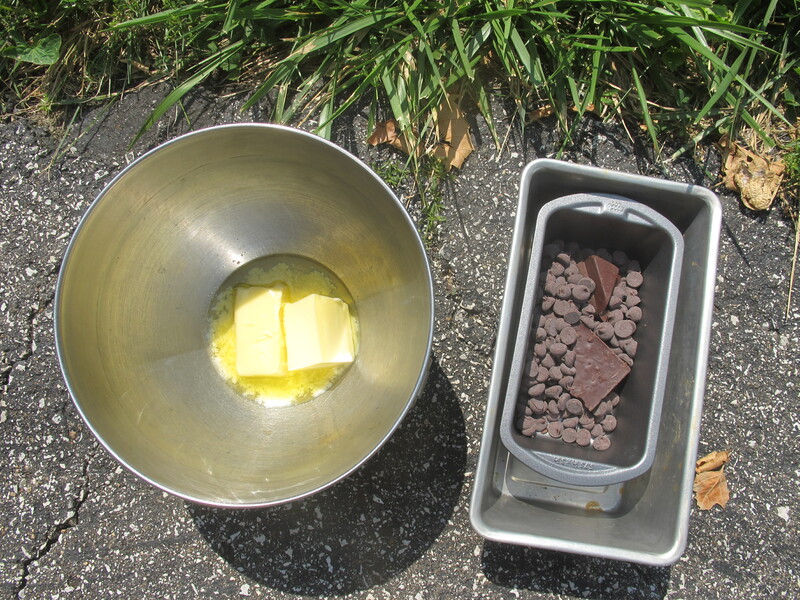 Actually, I went a step beyond no-bake and used solar heat to melt the butter and chocolate. 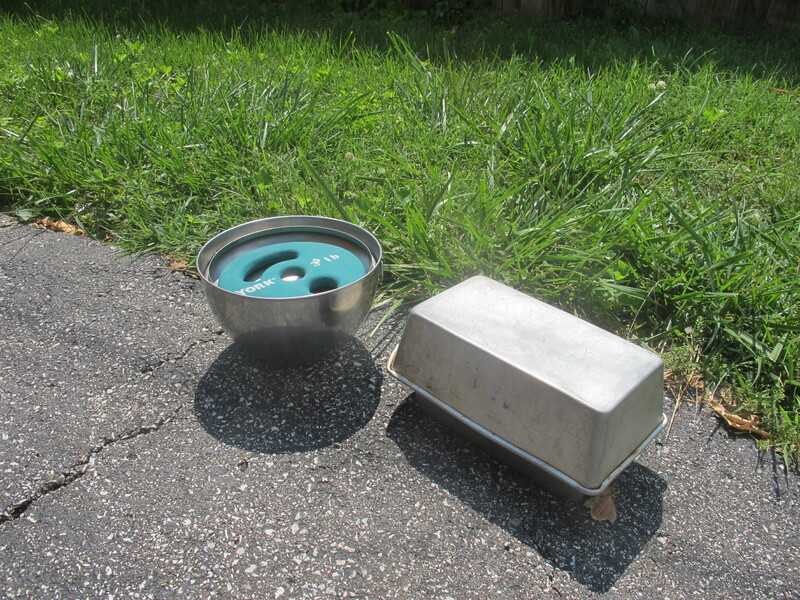 I put both in metal dishes (for optimal heat transfer) and set them on the blacktop pavement (hotter than lighter-colored sidewalk), both covered (and one weighted) to keep out any critters. Butter halfway melted and a before picture of the chocolate. The butter melted very quickly. The chocolate melted almost completely (and would have melted fully if I gave it more time) — I stuck the pan in the toaster oven for just a minute or two to finish the job. I made a half recipe (in an 8×8 pan), which was a good amount, as these are really more conducive to being eaten in tiny squares (like candy) rather than big pieces. I used semi-sweet chocolate instead of milk chocolate (of course! ), and added a quarter cup of almond meal (for the half recipe) since the mixture seemed a bit runny (perhaps due to using natural peanut butter). No final result pictures, but after setting up in the fridge, they popped right out of the pan, looking like those pictured in the recipe link. Delicious! This entry was posted in Biking, Food and tagged World Naked Bike Ride. Bookmark the permalink.